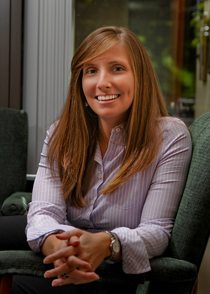 Dr. Rebecca E. Matthews, Ph.D. is a psychologist at 3-C Family Services in Cary, North Carolina, a Co-Parenting Advisor, and a Child Specialist for families transitioning through divorce. As a Co-Parenting Advisor, Dr. Matthews teaches her clients to communicate clearly with their spouses, to manage stress, and to skillfully resolve conflicts during the divorce process. As a Child Specialist, Dr. Matthews helps children and adolescents understand the wants and needs they have in the divorce process as well as those they will continue to have after their family has transitioned into the next stage of their lives. Dr. Matthews’ knowledge and experience working with children, adolescents, adults, and families help clients work through divorce by providing them with more confidence, a clear understanding of their own needs, and communication skills that will benefit many relationships in their lives. Dr. Matthews was born and raised in Raleigh, NC. She earned her doctorate degree from the University of North Carolina at Chapel Hill. She has expertise in the provision of psychotherapy, play therapy, and cognitive behavioral therapy (CBT) to children, adolescents, and adults. Dr. Matthews specializes in the treatment of individuals with anxiety, conduct issues, depression, and personality disorders. She has specific interest in adolescents and adult women with low self-esteem and a pattern of unhealthy relationships. Dr. Matthews’ experience includes an array of both research and clinical work. She has worked in state funded and private outpatient clinics, inpatient mental health hospitals, and in schools. She has worked with couples, who are often on the brink of divorce, to reconnect with their partners, to work through frustration, and to feel truly heard by their partner. Dr. Matthews has expertise in the fields of bully prevention and social-skills development through her work as a facilitator of social skill groups for children ages four to sixteen. Dr. Matthews was employed by 3-C Family Services’ sister company, 3-C Institute for Social Development, for over four years helping to develop and evaluate evidence-based psychoeducational interventions for children, adolescents, and families. These interventions are now being used in public schools and mental health facilities throughout the United States. In addition to her research focus on child and adolescent social skill development, she has extensive knowledge in the area of stress levels among parents of children with high functioning autism or Asperger’s Disorder. Because changes in people’s lives can sometimes take time to see through therapy, Dr. Matthews is drawn to activities in her personal life that provide immediate proof of success such as home renovation projects, working in her garden, and knitting. She also enjoys playing board games with friends and simply being outside.